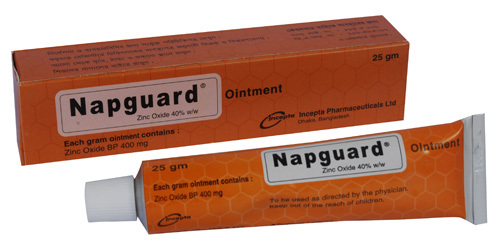 Napguard is a diaper rash ointment. Apply thin layer topically every 8 hourly. Change wet and soiled diapers, promptly cleans the diaper area, allow to dry and apply ointment liberally as often as necessary, with each diaper change, especially at bedtime or any time when exposure to wet diapers may be prolonged.